Supreme Court of the United States building. Supreme Courts are generally the highest appellate court in a judicial system, with no appeal being possible from their decisions. They are known by many names, including High Courts, Superior Courts, and Courts of Appeal. For more detailed treatments, see Supreme Court of the United States and State supreme court. 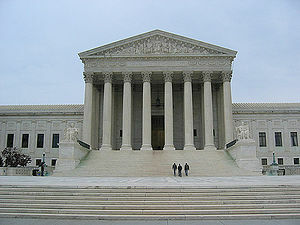 In the United States, the highest court in the federal court system, as well as the highest court in all matters within its subject-matter jurisdiction, is the United States Supreme Court. Each state also has a Supreme Court that serves as a final appellate court, although there are some variations in both name and court organization from state to state. In New York, for example, the "Supreme Court" is the trial court, and highest appellate court is the "Court of Appeals." For a more detailed treatment, see Supreme Court of the United Kingdom. In the United Kingdom, the Supreme Court was formerly the House of Lords, which was replaced in that role by the new Supreme Court of the United Kingdom on October 1, 2009. This page was last modified on 7 May 2018, at 10:00. This page has been accessed 21,625 times.